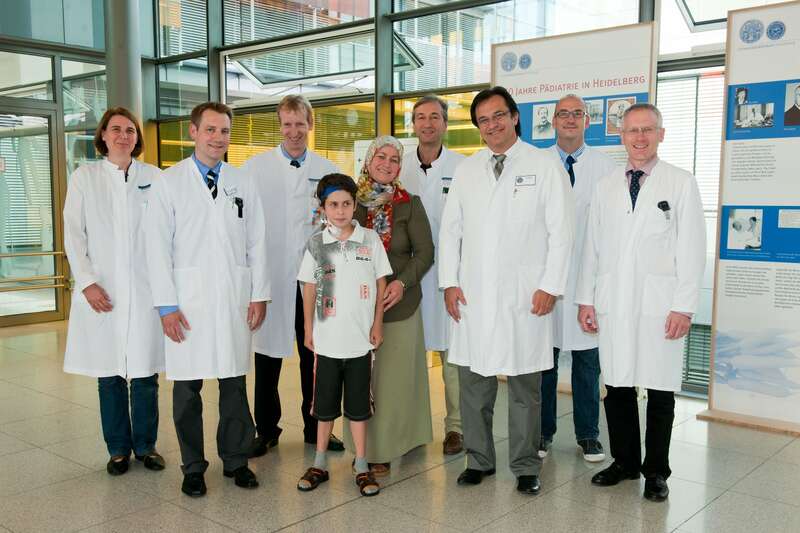 The 13-year-old boy Resat Nuri Yildiz received a new kidney and recovered well from the transplantation – despite tissue incompatibility. 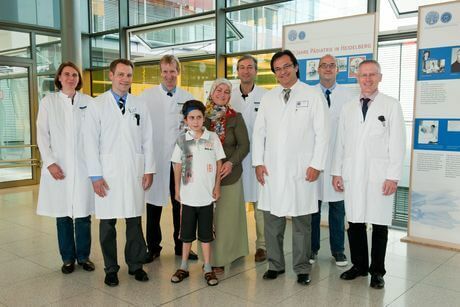 From left to right: Dr. Elke Wühl, senior consultant at the Division of Pediatric Nephrology, Dr. Christian Morath, senior consultant at the Department of Nephrology at Heidelberg University Hospital, Professor Jan Schmidt, head of the transplantation division, Resat Nuri Yildiz with his mother, Professor Burkhard Tönshoff, chief consultant at the Center for Child and Adolescent Medicine, Professor Caner Süsal, head of the antibody laboratory in the Department of Transplantation Immunology, Dr. Jörg Beimler, senior consultant at the Department of Nephrology at Heidelberg University Hospital, and Professor Martin Zeier, medical director of the Department of Nephrology at Heidelberg University Hospital. Donor kidneys can be successfully transplanted even if there is strong tissue incompatibility between donor and recipient. An interdisciplinary working group headed by Dr. Christian Morath, senior consultant at the Department of Nephrology at Heidelberg University Hospital (Medical Director: Professor Dr. Martin Zeier) and Professor Dr. Caner Süsal, head of antibody laboratory in the Department of Transplantation Immunology, showed in a study of 34 sensitized high-risk patients that the success rate in these patients was not different from the success rate of patients with a low immunological risk. After one year, around 95 percent of the transplants were still functioning. The researchers in Heidelberg developed a sophisticated therapy concept especially for this group of high-risk patients. This makes the transplantation center in Heidelberg the leading center in Germany in this area. The results of the study were published in the prestigious journal “Transplantation”. When the kidneys no longer function, patients must either undergo dialysis regularly or receive a donor kidney (transplantation). The organ comes either from a brain dead donor or a person close to the patient (live donor). The blood type and tissue compatibility factors (HLA factors) of donor and recipient should be matched as closely as possible. Since the recipient organism always attempts to reject the foreign organ, even if it has the same HLA factors, patients have to take medication after transplantation for as long as they live to suppress rejection (immunosuppression). Researchers at the Heidelberg Department of Transplantation Immunology collected data over many years in the world’s largest database for kidney transplantation (Collaborative Transplant Study) in order to identify patients who are at a high risk of immunological rejection. These are patients who have formed antibodies against foreign tissue, for example after pregnancies, blood transfusions, or previous transplantations, and therefore have only a slight chance of receiving a donor organ for which the tissue compatibility test (crossmatch) directly before the operation is negative. “The risk of rejecting the transplanted organ soon after the operation is especially high in this group of patients. High-risk patients can receive transplants successfully only if additional measures are taken,” explained Professor Dr. Caner Süsal, head of the antibody laboratory at the Department of Transplantation Immunology. In the current study, 34 high immunological risk patients were given plasmapheresis or immunoadsorption before and after the transplantation of a donor kidney from a brain dead (28) or live donor (6). These are procedures that remove the antibodies from the blood of the organ recipient. In addition, the patients were given a drug (Rituximab) that destroys the cells that could form new antibodies. With the help of intensive immunosuppression and close monitoring for any signs of rejection, some 95 percent of the transplanted kidneys were still functioning after one year. Complications from the stronger immunosuppression in comparison with non-sensitized patients were rare and were easily overcome. “With the aid of the criteria we tested, we were able to transplant kidneys to patients who would formerly have needed dialysis their whole life, and at success rates corresponding to those of non-sensitized patients. Our high risk patient program is a good example of how results from research can be successfully implemented clinically after intense evaluation,” Dr. Christian Morath and Dr. Jörg Beimler, senior consultant at the Department of Nephrology at Heidelberg University Hospital, were happy to report. “If we proceed according to the new methods, obstacles such as blood group incompatibility and a positive crossmatch are no longer criteria for exclusion for transplantation,” added Professor Jan Schmidt, head of the division of transplantation surgery. A total of 49 patients have now been treated successfully using the regimen, most recently a child of 13 who was the youngest patient thus far to benefit from the program. “The boy is doing well and the kidney has already begun functioning completely,” reported Professor Burkhard Tönshoff, chief consultant at the Center for Child and Adolescent Medicine. Transplantation in high-risk patients requires the exchange of information between specialists daily or sometimes several times a day and seamless interdisciplinary communication. The excellent results show that the cooperation of various disciplines at the Heidelberg Transplantation Center functions well. Heidelberg University Hospital is one of the largest and most prestigious medical centers in Germany. The Medical Faculty of Heidelberg University belongs to the internationally most renowned biomedical research institutions in Europe. Both institutions have the common goal of developing new therapies and implementing them rapidly for patients. With about 7,600 employees, training and qualification is an important issue. Every year, around 550,000 patients are treated on an inpatient or outpatient basis in more than 40 clinics and departments with 2,000 beds. Currently, about 3,400 future physicians are studying in Heidelberg; the reform Heidelberg Curriculum Medicinale (HeiCuMed) is one of the top medical training programs in Germany.